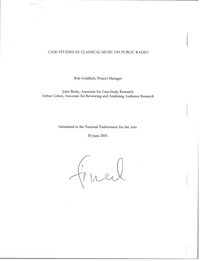 Analysis of six case studies of classical music programming in radio markets in Philadelphia, Atlanta, South Florida, Jackson (Miss. ), Las Vegas (Nev.), and Columbus (Ohio). “The principal focus of this study is to document the way research has been taken into account” in classical music programming decisions.